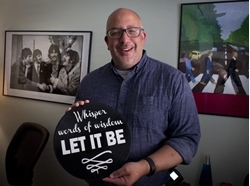 Paperback Writer: Principal's love of the Beatles . Beatles Radio: The Beatles, Solos, Covers, Birthdays, News The Fab 4 and More! In 2013, Gaillard was the principal of Wiley Middle School, hopeful that an application for a $1 million federal grant would transform the school into a cutting-edge learning center for science, technology, engineering, arts and math. That dream crashed hard when Gaillard learned that the grant was not approved, leaving him with the difficult task of breaking the news to a staff that had worked tirelessly on the application. As he had many times over his life, Gaillard sought comfort in the music and lives of John Lennon, Paul McCartney, George Harrison and Ringo Starr, the Beatles. A Beatles fanatic, Gaillard is well-versed in the band’s history. Standing there in front of his faculty, he recalled the words a defiant McCartney uttered when the press all but declared the band yesterday’s news in 1966. “You just wait,” McCartney said, according to band lore.